We’d like to think Feeling Gloomy NYC casts a wide net, but there’s one thing that always has us feeling particularly gloomy, and that is synthesizers. Giant moody pads, icy arpeggios, sequenced drums, stolen voices sampled over keys they never ought to have been in. So every now and again (well, this will be the second time, I guess) we like to pay tribute to the entire genre of synthpop. Re-enact the Chopsticks scene from the film Big with our giant keyboard! * We’ll put it on the stage for you to stomp on to your heart’s content. Our cake master pal will be creating a concoction of to tickle your ebonies and your ivories. Expect chocolate. 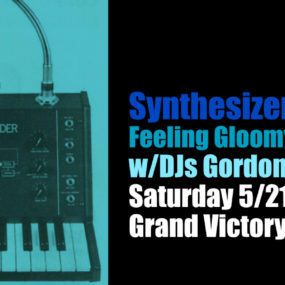 Your faithful DJs Gordon + Nathaniel Gloom will unleash their collections of synthpop onto the dancefloor. You’ll dance with tears in your eyes to Midge Ure, sleep in Metropolis with Anne Clark, count anything and everything in large amounts with Dave Gahan and Martin Gore, and ride the Metro with Terri Nunn. We won’t stop for anything (except for a cake cunningly conceive to appear like a synthesizer).